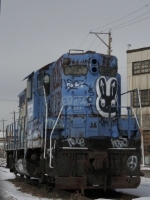 Description: probably a GP-10, taggers seem to know ALCOs are off limits. Description: This loco is owned by the Gopher State RR Museum...hopefully it'll be moved to more secure storage soon. Description: Gopher State Railway Museum GP9 #7332 rusts outide the MNNR roundhouse. Description: At Minnesota Commercial Yard. Description: This gem of the inner-city sits behind the Minnesota Commercial shops along Cleveland Ave.